Summer is here and has brought the heat and humidity we’ve come to expect along for a ride. If you have a collection, there are many preventative things you can do to keep your art safe…in this article we hope to offer some practical advice on keeping your personal treasures…safe and sound! The ideal temperature should be 65 to 75 °F and the relative humidity should be between 55% to 65%. Don’t turn off the air conditioning before leaving your home, even for a short weekend getaway. Consider the installation of a compact digital thermo-hygrometer so that both temperature and humidity are consistently being monitored. When a room is not in use, draw the blinds, curtains or shades. Create a cool and dark environment; turn off the lights whenever possible. Put UV filters on windows. 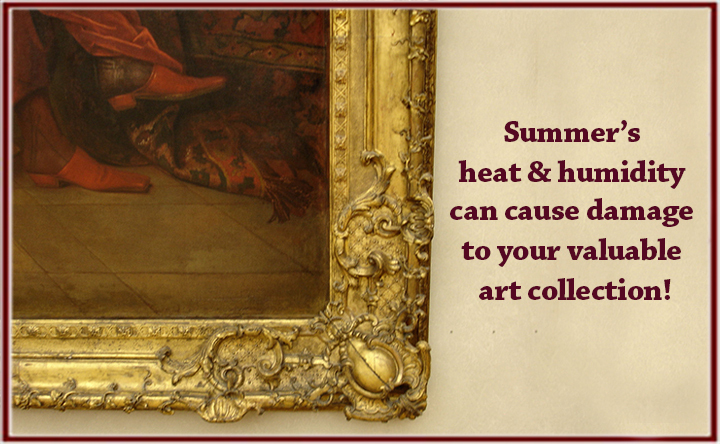 Hang art in locations that are out of the way of ventilation, doors & windows. While your basement and attic may have the most space for your art collection storage, it may not be the best choice. Both are subject to extreme temperature fluctuations, floods and leaks. Outfit your art closet with horizontal storage racks. Put a lock on the door to your closet. Be sure the artwork is wrapped in archival materials. Store the art face-to-back in a vertical position. It is no secret that water damage could ruin a piece of art. Luckily there are several precautions you can take to keep it from happening to you. Use caution when hanging art in areas beneath ceiling trays, washers, dryers and / or radiators. Install water alert sensors that will inform you if you have a leak. When hanging painting be sure they are raised 6 – 12” off the floor. A fire in the room art is hung would quickly destroy an art collection but the damage done from soot and smoke could be equally detrimental. Be sure you have smoke detectors installed within 100 feet of your collection. If you are a collector or if you are considering starting a collection, review your insurance coverage to be sure it covers your treasured assets. You may be surprised to find your collection is not covered under your standard homeowner’s policy. If you have any question at all regarding the level of coverage a collection needs or regarding the provisions your particular policy provides, please give the insurance advisors at Advocate Brokerage Corp a call. Additionally, be sure you have an up to date archive of your collection. Creating a detailed report can help in the event of damage. Photographs of your art. From varying angles and in different light. The title of the piece of art. The medium. Is it a photograph, painting, sculpture? The dimensions of the work. Detail any marking, inscriptions or other distinguishing features that may identify the piece or indicate its value. The date and place you purchased the artwork. Include a brief description of the piece. Include any receipts or other proof of purchase.